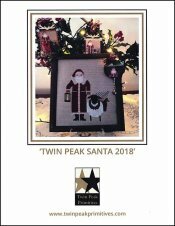 Twin Peak Santa 2018 [C5799] - $12.00 : Yarn Tree, Your wholesale source for cross stitch supplies. Cross stitch pattern by Twin Peak Primitives. Santa in his warm & cozy red coat, carrying a lantern to guide his way, has a sheep by his side. With a wreath around his neck & a bag full of toys on his back, the sheep is ready to help Santa with his special deliveries! Stitch count is 88W x 101H.